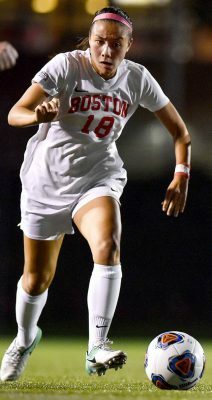 The Boston University women’s soccer team will host Lehigh University Saturday at 4 p.m. on Nickerson Field in an inter-division matchup. The Mountain Hawks (3-5, 0-1 Patriot League) are coming to Boston after being defeated by Patriot League rivals the United States Military Academy 1-0 Saturday afternoon. Conversely, the Terriers (1-7-2, 0-0-1 Patriot League) opened Patriot League action this season with a double-overtime 1-1 draw against American University. After the American match, BU head coach Nancy Feldman spoke to the difficulty of starting conference play. The Mountain Hawks have not been converting on their scoring chances throughout the season, outshooting their opponents at a 107-90 clip but being outscored by a margin of 10-5. Lehigh’s shutout defeat at Army (5-1-4, 1-0 Patriot League) saw the team’s offensive attack stifled thanks in part to solid play from Black Knight goalkeeper Sydney Cassalia, who amassed seven saves. Mountain Hawk midfielders Sabrina Mertz and Lisa Kestelboym had chances to put Lehigh on the board with back-to-back shots on goal in final ten minutes of the match but ultimately failed to capitalize on the opportunities. Army opened up the second half with an offensive blitz that ended with co-captain Sydney Witham’s goal in the 50th minute, which proved to be the deciding marker to down the Mountain Hawks. Lehigh’s last win came against Temple University at home Sept. 7, which was followed by a double-overtime loss in Baltimore against Towson University. The Mountain Hawks’ 2-0 win against Temple featured a strong offensive performance, including an onslaught of 16 shots in the first half and goals from freshmen strikers Rebecca Van Siclen and Courtney Supp. The goal was Van Siclen’s first in her collegiate career and earned her the title of the Patriot League’s rookie of the week, the team’s first recognition of the season. Lehigh forward Kayla Arestivo tallied her second goal of the season during the overtime loss to Towson,while Mountain Hawks goalkeeper Miranda Royds put together 11 saves. The Terriers played Lehigh once last season in Bethlehem, ending in a 0-0 draw after double overtime. BU outpaced the Mountain Hawks 9-2 in shots on goal, including three from sophomore forward Anna Heilferty. Senior forward McKenna Doyle and classmate midfielder Dorrie Varley-Barrett also made attempts late in regulation, neither of which converted. The game had also been sophomore goalkeeper Amanda Fay’s third straight shutout at the time, during which she made two saves. Prior to the Terriers’ draw against American (5-1-3, 0-0-1 Patriot League) Sunday, BU was defeated by the Mountaineers of West Virginia University 4-0. The Mountaineers (4-2-3) featured a high-powered, 27-shot assault on the Terrier defense, however, freshman goalkeeper Morgan Messner prevented three goals during her time in net. Doyle, who was named a preseason All-Patriot League honoree, made her first return against American since the Sept. 2 match against the University of Connecticut. Heilferty, BU’s current leading scorer, nullified the Eagles’ early advantage in the eighth minute, while 11 other players contributed attempts on goal through the final moments. The Terriers were the only team to get off a shot during extra time. BU offense buzzed with an impressive offensive attack, amassing a 25-8 shot advantage against American. Saturday’s game at Nickerson Field will be the first opportunity for Terrier fans to see women’s soccer in action since the team’s 1-0 loss to arch-rival Boston College Sept. 6. Five of BU’s final nine regular season matchups will be at home, a possible break from their 0-5-2 away record. Despite its most recent draw, Feldman saw good habits in her team.